It’s time for the Weekend Herb Blogging recap! Started by Kalyn, of Kalyn’s Kitchen almost 2 1/2 years ago it has been a continuous success. 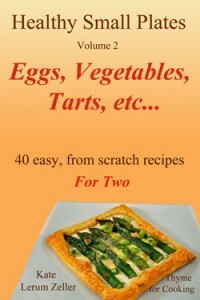 This is the 125th week of wonderful herb, fruit a vegetable recipes from around the world. Or, at least, that’s how it’s supposed to work. Somehow, Anna, of Morsels and Musings, and I managed to miss each other this weekend. Which was a shame since her ethiopian sauteed fish looks far too good to be ignored. Anna is exploring the cooking of East Africa this year, and is even making her own spice blends. I would have to be careful of the peppers (wimp that I am); but the limes, now THAT is something I will happily indulge in…. Rita, of Mochachocolata-Rita, Hong Kong is telling us the steamy tale of the romance of a Ms Daikon and a beefy guy named Brisket. 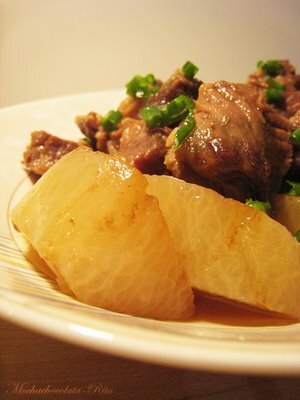 I would not have thought of using daikon this way – it look delicious! 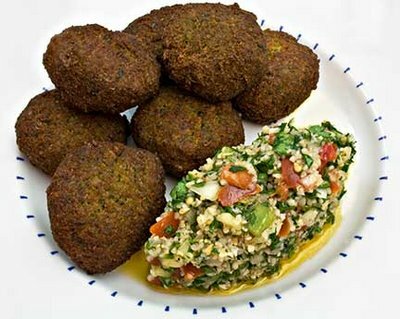 Laurie, of Mediterranean Cooking in Alaska, Alaska, is happy to explain the correct way to make Falafel. She is also happy to explain the incorrect way. As she has tried both, she says she prefers the correct way, and even tells why. I can relate to the whole story – only too well! Nor of many of the ingredients that went into this Vegetable Tinola. But Gay, of A scientist in the kitchen, assures us it’s delicious. Divya Vikram, of Dil Se, Glendale, CA, is much more creative and ambitious for lunch than I am. 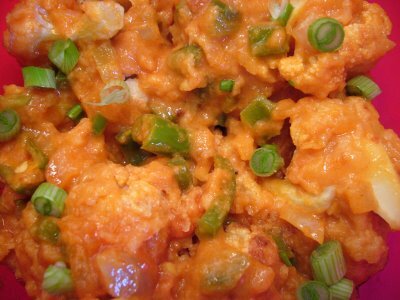 She made this lovely Gobi Manchurian, a dish she says she always orders in restaurants. Lightly fried cauliflower and the lovely sauce? I’m hooked! 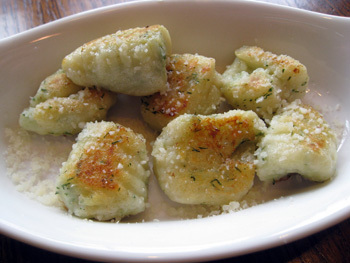 From Alexandria, Virginia (lovely area), Ramona, of The Houndstooth Gourmet, gives us a gorgeous Gnocchi with Dill and Pecorino. I love dill, and I try to expand my use beyond fish and pickles, but I don’t often think of it with pasta/potatoes/gnocchi. Something else I dearly love: Cashews! Lisa, of Lisa’s Kitchen, London, Ontario, made this wonderful dish, pairing rice and potatoes: Cashew Rice with Diced Potatoes and then finishing with cashews. Rice and potatoes in the same dish, you say? She explains why it works. Georgette, of Weak Weary Mom, in the Southwestern US, has an herb garden that is just coming back to life (like mine). 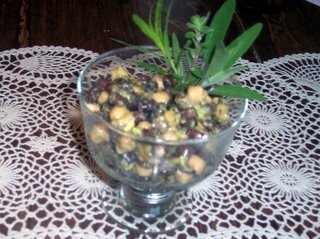 She was able to pick enough for this lovely Avocado Bean Salad with Herbs. The avocado makes it all creamy and comforting; the herbs make it all spring like. 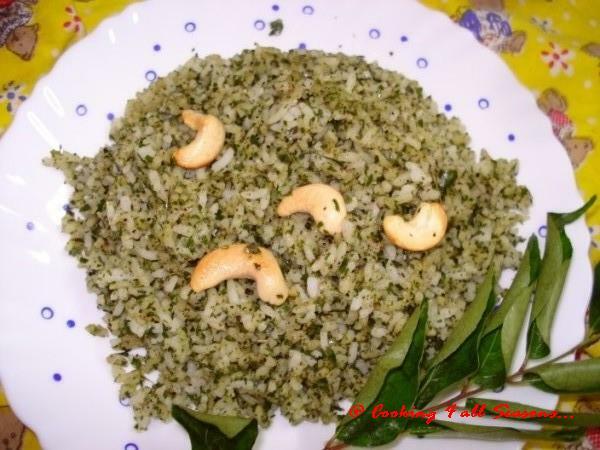 From India, Srivalli, of Cooking 4 all Seasons, is talking about curry leaves (as well as some lovely memories). 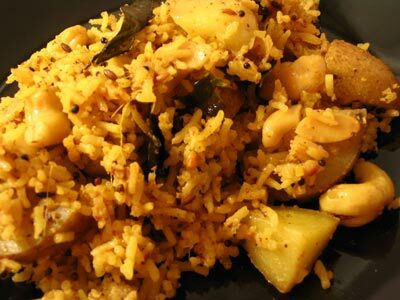 They are incredibly important to Indian cooking and are showcased in this lovely Spiced Curry Leaf Rice. You can also get this leaf in powder but she tells how to toast them to make your own. And says it’s very good when one is having a bad day….hmmmm Need that! I learned about Tree Tomatoes from Gretchen, of Canela & Comina, in Lima Peru. No, that is not a typo: tomatoes from trees. Native to the Andes region, it is now cultivated in Portugal, New Zealand and other South American countries. 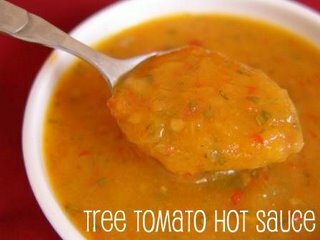 She used it to make this gorgeous Aji de Tomate de Arbol, Tree Tomato Hot Sauce. My friend, Ulrike, of Kuchenlatein, got some good, old Minnesota Wild Rice at Christmas. 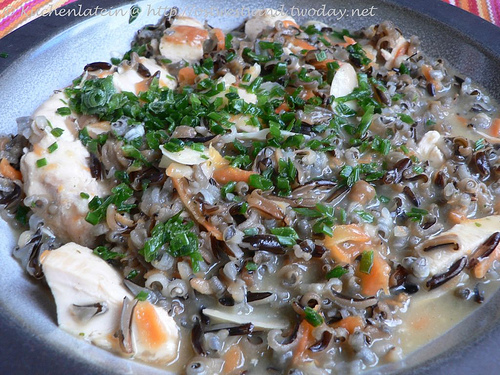 She made the classic Chicken Wild Rice Soup. By all appearances she did a perfect job! I couldn’t begin to count how many bowls I’ve eaten of this wonderful soup…. And this looks like the best yet! Wandering Chopsticks, in Southern California , has made a Vietnamese chicken curry: Ca Ri Ga.
We learn that it is closer to a stew than the more familiar Indian and Thai curries. The emphasis is on the flavored broth rather than an abundance of other ingredients. 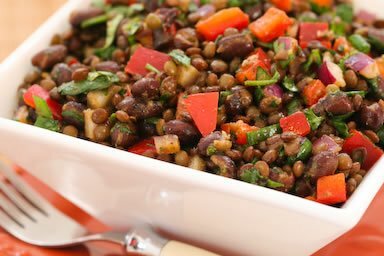 From Utah, our beloved founder, Kalyn, of Kalyn’s Kitchen is sharing one of her personal classics: Black Bean and Lentil Salad with Red Bell Pepper, Cumin and Cilantro. Wouldn’t you have loved to be on a dinner cruise catered by Kalyn? Just to have this salad? BTW: for those of you (us) who have the anti-cilantro gene, she has a great suggestion for a substitution…. Tanna, of My Kitchen in Half Cups, is making me farsick for Italy. 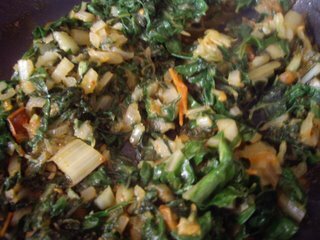 Three of my favorite vegetables plus one of my favorite herbs…. It’s healthy, hearty and comforting. What’s not to love? 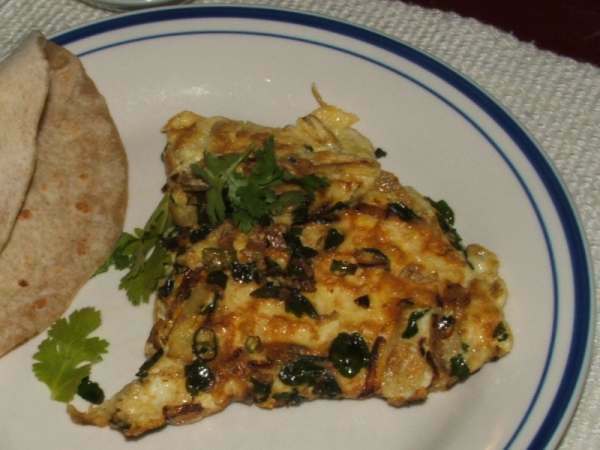 From the frozen north (Toronto, Canada), Elizabeth, of blog from OUR kitchen, has made a Moringa Leaf Omelet with Chapatis. Note: After reading all of these wonderful recipes, it has become apparent that I need to find an Indian grocer… Or find the plant and grow it myself, much easier. According to Elizabeth, this herb has over 100 different names… And makes an excellent omelet! We were so excited to see all of the "A" vegetables (artichokes, asparagus, ail) at the markets this week. 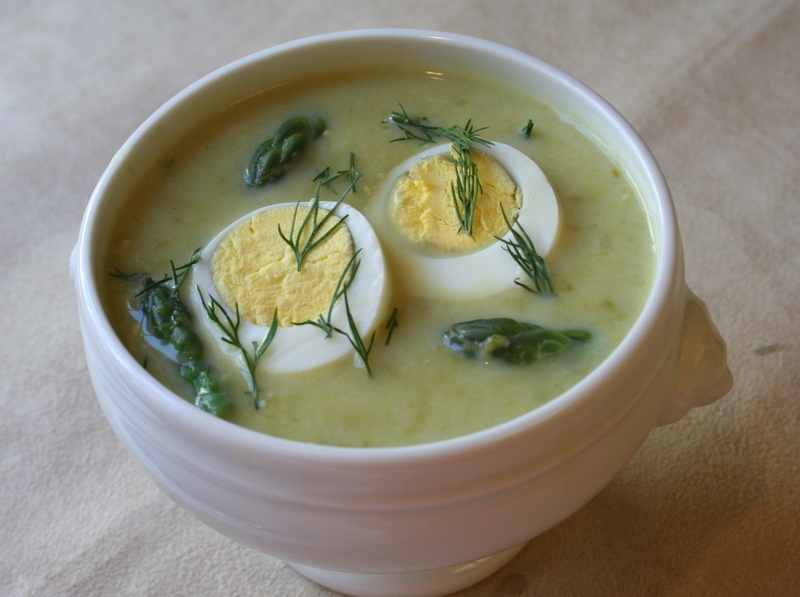 And even more excited to see this gorgeous Asparagus, Potato and Dill Soup that Sher, of What Did You Eat? made. 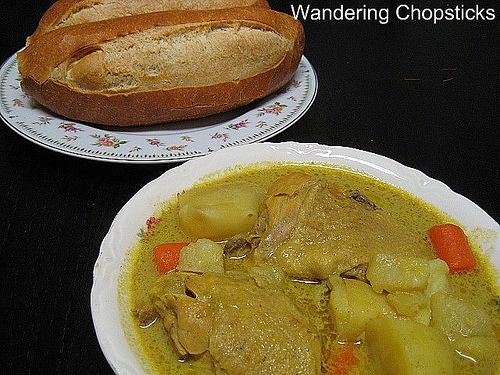 Thickened with potato and flavored with dill: this is just screaming SPRING! The garnish makes it a perfect Easter first course! Jennifer, another American living in France (but much further south: Cesseras) and writing at Like to Cook is a baker at heart. 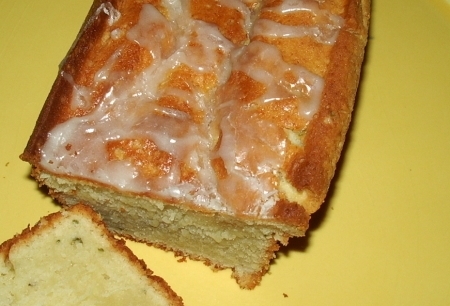 She has captured the south of France with this lovely Lavender Tea Cake. I’ve used lavender flowers, and have lavender in my herb garden, but I have never used the leaves! I will in this cake, though… Yum! Coming to us for the very first time: Neen and Do, of Post-Collegiate Cooking à Deux! 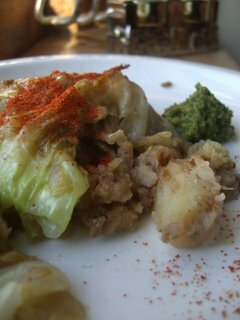 Neen has made Ashkanaz Stuffed Cabbage – Indian Style. Not only do we get a dish filled with incredible flavors (and interesting combinations) but a brief primer on the (very) different Jewish cooking styles. No Matzo soup for the Mediterranean Jews! But I’ll take these wonderful Cabbage Rolls any day! 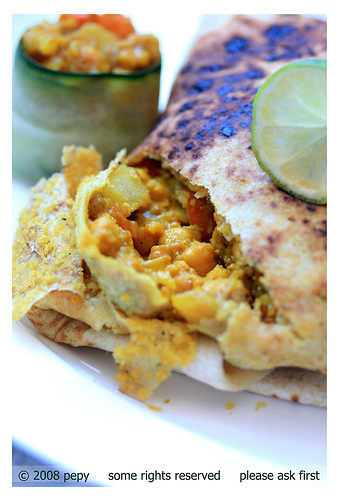 Indonesia-Eats, of The Art and Science of Food, Winnipeg-Manitoba, Canada is giving us a gorgeous recipe for Chickpeas Vegetable Roti. Again, I am out of my element here, with this beautiful Caribbean – Indonesian food. For this recipe, I think I can (and will) be able to find all of the ingredients. It all sounds so simple to make – and simply delicious to eat. Another Canadian, Kevin, of Closet Cooking is cooking lamb. This time of year (spring and Easter) our markets have lots of lamb at reasonable prices. 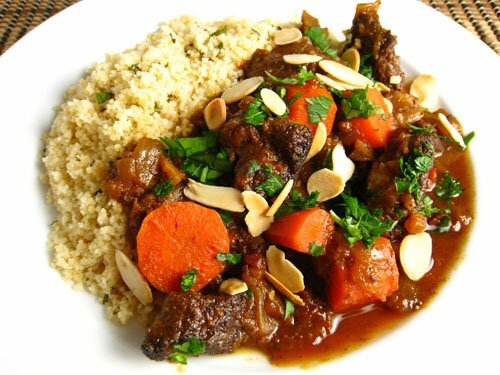 Now I have to try Kevin’s Moroccan Lamb Tagine. I don’t have the tagine, but, then, neither does Kevin. He made this gorgeous stew in a regular Dutch oven. 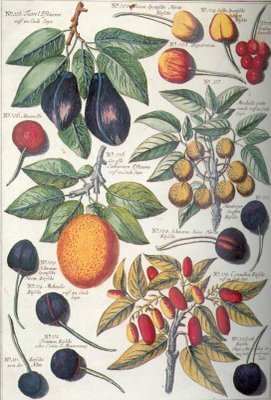 Just reading the list of wonderful herbs and spices makes me drool. The Chocolate Lady, of In Mol Araan, Greenwich Village, New York, has a lovely, simple recipe for making Prune Filling for Cookies, Tarts or Homentashn. It can be flavored with laurel, citrus or vanilla. A dash of plum brandy for a nice finish. I am planting Swiss Chard in my garden this year. 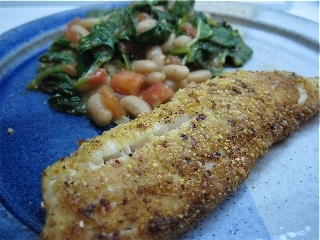 I keep seeing wonderful recipes, like this one from Rinku, of Cooking in Westchester. And I’m going to make it…as soon as my chard grows up! You can have your Mac & Cheese, or Beans on Toast. When I want comfort food I’ll eat with Haalo, of Cook (almost) Anything at least once. 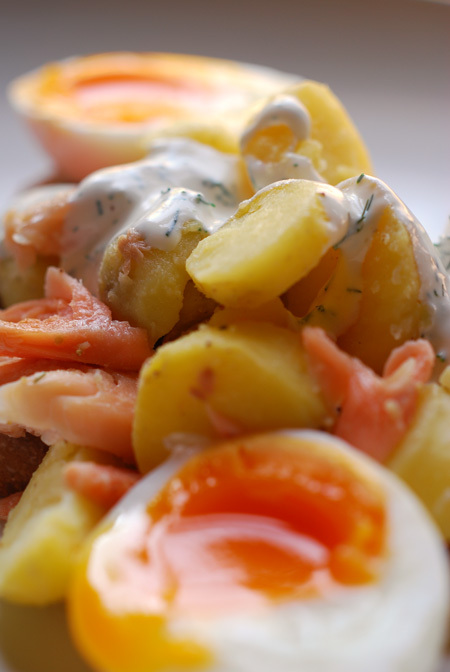 Her Smoked Trout and Kipfler Potato Salad, flavored with dill and garnished with a perfect soft boiled egg …. 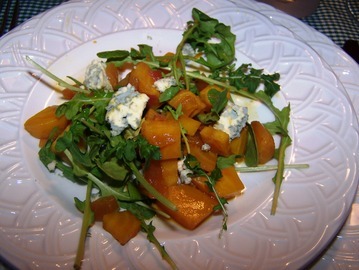 Jerry, of Jerry’s Thoughts, Musings and Rants, has turned to Arugula for a lovely spring salad: Golden Beet with Arugula and Blue Cheese. Arugula has been know since Roman times, and it’s peppery flavor, along with the earthy beets, and a bit of blue, is not only pretty but perfect for early spring. 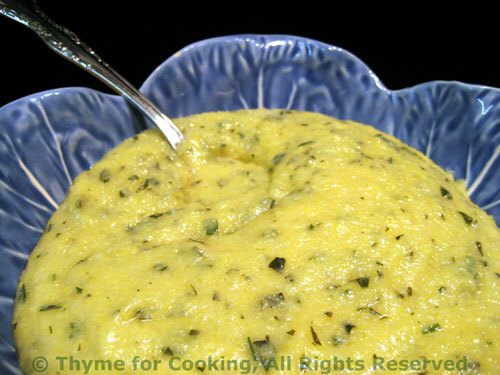 And, finally, and most humbly, I’ll tack on my little dish to this incredible recap: Creamy Herbed Polenta. And that’s it for the Easter Weekend Herb Blogging. If I missed your entry please let me know and I will include it immediately. But please make certain that you include a reference to Weekend Herb Blogging and to my site (with a link). What a beautiful collection of dishes. Thanks for all the work. I’ll be back(after work, sigh) to read the ones I missed. This seems a specially wonderful month of goodness. Thanks for this especially lovely recap!! You always rock Katie! Great roundup, Katie! There are so many dishes here that I neeeeeeeeed to try! I love that Gay’s Vegetable Tinola calls for moringa leaf too except Gay uses the Philippino name for it: “malunggay”. P.S. Great news! Even though it snowed last night, it was quite sunny today and there are parts of the garden visible. Maybe we will get spring! P.P.S. I do hope you get to try curry leaves. They have such an intriguing flavour. Like nothing else. Perhaps by a miracle you could get a curry leaf plant… just make sure you get “Murraya koenigii”. There is another plant (Helichrysum italicum) posing as curry leaf that absolutely pales in comparison. Murray koenigii isn’t the easiest thing to grow in a pot but it can be done (alas, my little curry leaf plant died a couple of years ago and I have been too lazy to replace it – it’s so much easier to buy curry leaves from one of the nearby Indian grocers). You’d probably have more success because of your warmer climate. Loved the commentary Katie – couldn’t help from laughing over and over again. You have a wonderfully wicked wit! Great job on the roundup; I really enjoyed it. oh, dear I missed it last week! as usual, healthy entries. well done, katie. Great roundup! There are a lot of tasty looking dishes. Katie, lovely round up! It is great to see so many fresh vegetables used in so many creative ways! Thanks so much for your work putting this together! Wow – this is some round up! Thanks for all your hard work putting it together. I am sorry I didn’t make a dish in time for this fantastic group! i’m a total idiot! i forgot to email you the link. and i was really pleased (and proud) of this week’s recipe! 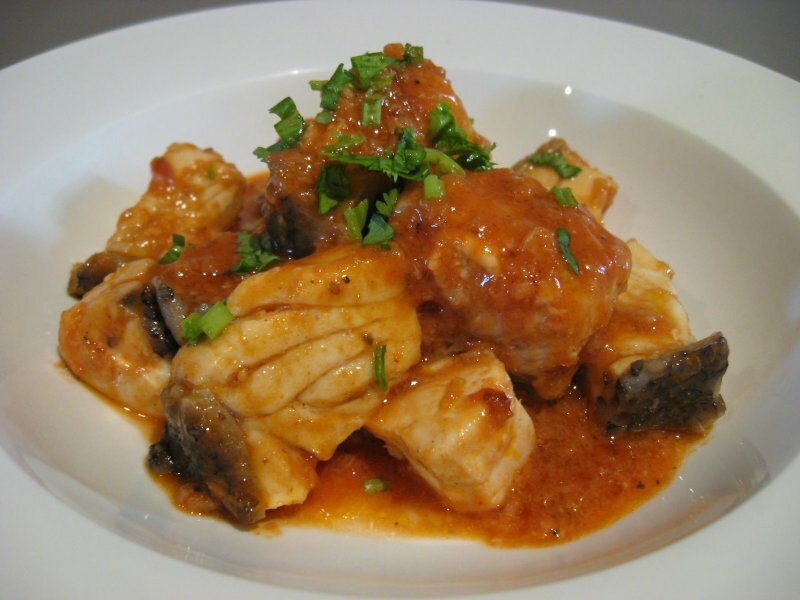 i made yasa tibs, an ethiopian dish of sautéed fish with lime and the ethiopian spice berbere. Thanks Katie, for stopping by and hosting this event. Great round up, anyway. Srivalli, it was an incredibly interesting week – at least, for me! Kalyn, thanks…too bad about that work interfering. Nuria, but one is supposed to relax on holidays…that’s the point, isn’t it? Thanks, Betty, we did – and no snow! ejm, we had sunshine ourselves today, for a change. My herb garden just keeps expanding..
Arfi, that time just likes to slip away, doesn’t it? Kevin, too many for my days of the week…I’m going to have to start cooking lunch! Thanks, Gretchen, I’m just happy that we’re starting to see more spring veg at the markets! Chris, pas de probleme…just keep on making sweets! Anna, I fetched it and added it! Thanks, Pepy, it was fun! What an amazing array of deliciousness! 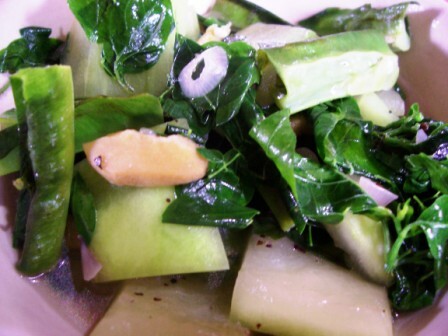 Although it is all amazing, I am most intrigued by this “Tinola”–I hadn’t heard of it either! Of course, I am sure that it would be a wonderful “warmup” for that gorgeous lavender tea cake! Cakespy, it all sounds wonderful! I need to start traveling to the East so I can try some of this stuff!